We've noted the likelihood of being sued after completing a deal, especially a large one. An article in the Wall Street Journal suggests that a recent court ruling may make those suits less attractive to plaintiffs lawyers. In particular, companies are adopting a clause that requires plaintiffs to pay the firms legal fees if a suit fails. The court upheld a bylaw a company had adopted requiring such payments. 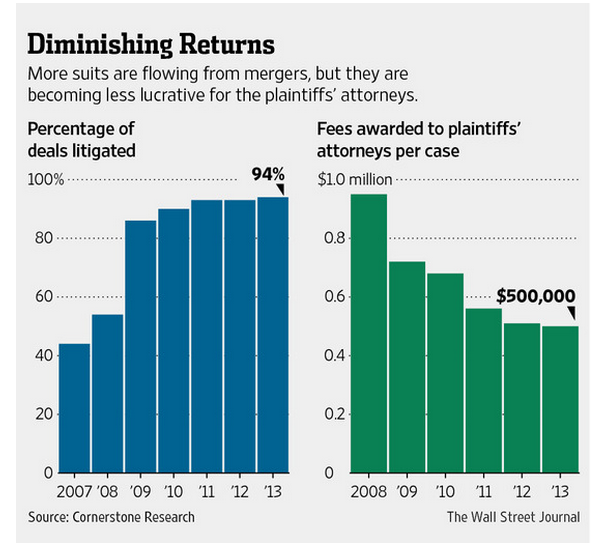 The article also reveals declining awards for plaintiffs' attorneys over recent years.